Who wants to clean a piping bag after each use, or purchase them constantly to have them tear? No thanks. I learned this trick from the Fend For Yourself household. As long as your grocery store sells milk in plastic bags, you’re in luck. 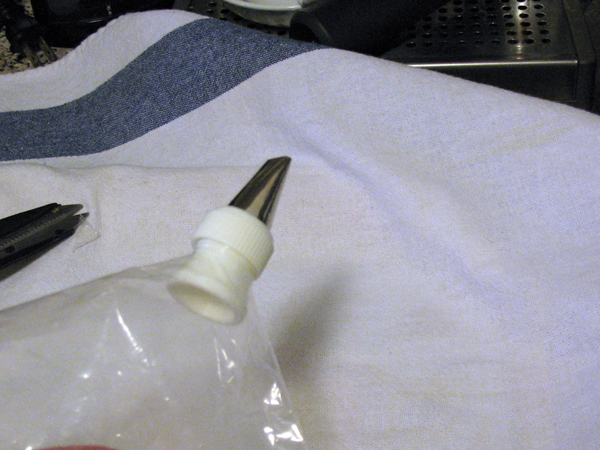 Once the milk is gone, you have an empty bag which is the perfect size and shape for a piping bag, and strong enough to hold up to piping without tearing. Score! 1. 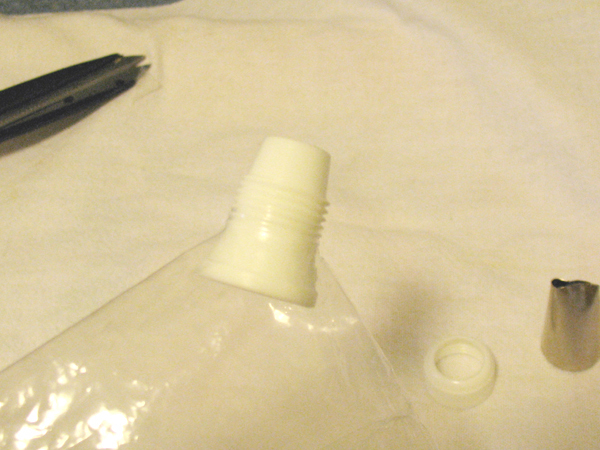 After the milk is gone, take scissors to the existing hole at the top of the bag, and cut open the end, so one end of the bag is now completely open. Wash the bag thoroughly, and use paper towel to blot dry, both inside and out. Prop the bag open on something like a whisk and leave it out overnight, the air will be able to circulate and dry it completely. 2. 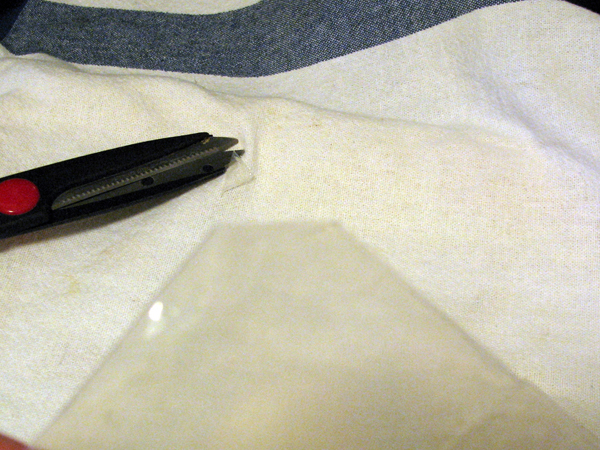 Cut a small triangle off the closed end of the bag. This is where the coupler will go. Cut conservatively, you can always widen the hole, but you can’t make it smaller. 3. Push the coupler into the hole, see how the plastic comes right up to the threads on the coupler? Perfect fit! 4. Place the frosting tip and ring over the coupler, screw into place. 5. Turn down the edges off the bag and spoon the frosting into the bag. 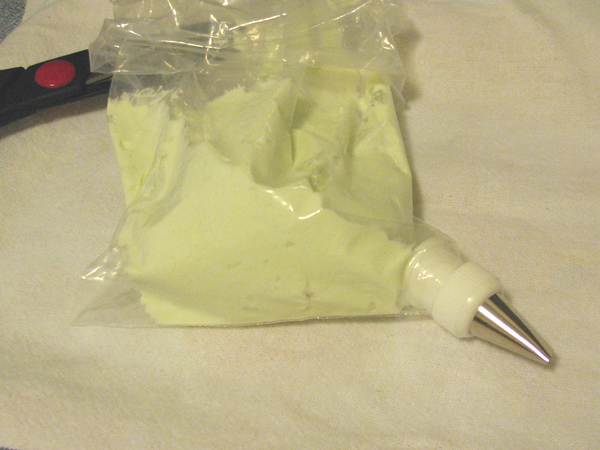 Don’t overfill the bag, you can always add more frosting later and the heat from your hands will soften the frosting. No point exposing all the frosting to that heat until you need it. A lighter bag is also easier to pipe with. 6. Those air bubbles just won’t do. Starting at the open end, squeeze the bag. This pushes the air out and forces the frosting down into the tip. 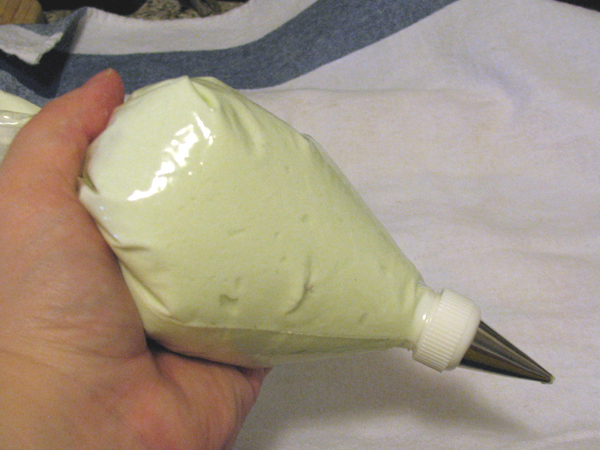 Expel some frosting onto a spoon to check you have a good flow going, this is a perfect time to taste-test your frosting. Actually that would be when you are making the frosting but I believe a good baker should always test her frosting as she frosts. Just in case, you know, something changed after you made it. That’s my excuse anyway. 6. You are now ready to use your ninja frosting skills! Pipe well, grasshopper. What I really like about this idea is that it’s free and disposable. No matter how much icing I pipe out, I always have a fresh supply of new piping bags from our continued consumption of milk. I would not suggest trying to clean and reuse these after piping. 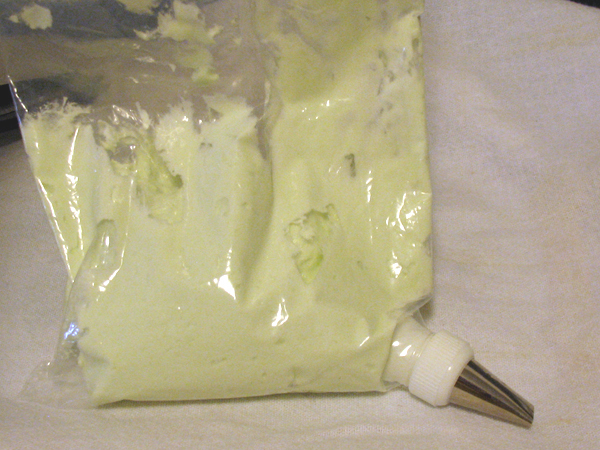 The milk bags are durable up to a point, but forcing frosting through the hole will stress the plastic and eventually it’s going to tear, but they will last long enough to frost a cake or a batch of cupcakes. 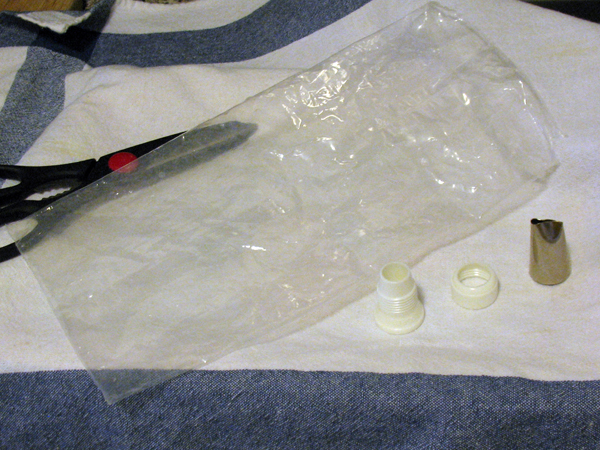 I don’t want to clean a used piping bag anyway, so a reusable one isn’t for me, and I don’t want to spend money on disposable bags when I already have free disposable bags at home. Save that money for the important items like premium vanilla extract and Belgian chocolate. Nobody will care what implements you used, but they’ll notice the taste difference of delicious high-end ingredients. This is awesome, and I never would have thought of this on my own!